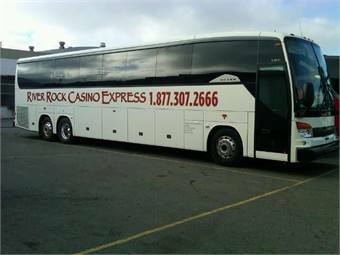 Sanmo Travel, a full service bus and charter travel agency located in San Francisco, took delivery of six Setra TopClass S 417 luxury coaches and four Setra ComfortClass S 407 touring coaches to be added to its touring fleet for the River Rock Casino Express. This marks the inaugural delivery of the first Setra ComfortClass S 407 to be delivered in the state of California. All of Sanmo’s Setra TopClass S 417 and Setra ComfortClass S 407 motorcoaches embody luxury and style with beautiful exterior styling, durable and reliable driveline technology, and innovative electronic equipment that benefits both the environment, passengers and provides the owner low maintenance costs. Powering both of the Setra coaches are the Mercedes-Benz OM 471 EPA 10 engine with fuel efficient BlueTec technology backed by an Allison transmission. The Selective Catalyst Technology and Diesel Particulate Filter work together to reduce harmful environmental pollutants. To complement the exterior European styling of the motorcoaches, two of the Setra TopClass S 417 come equipped with an optional TopSky glass roof, which runs the length of the bus, allowing more natural light to filter into the cabin. Optional hardwood floors, interior wood accents, center arm rests and lustrous red metallic paint add an element of panache and style to the coaches. The Setra ComfortClass 407 models will provide Sanmo customers the generous features of a spacious cabin, auto-retracting seat backs, individual LED reading lights and Bosch audio system.